The Theodore Monod African Museum, for a long time called museum of Dakar or museum of IFAN, is a museum located in Dakar and part of the fundamental Institute of Black Africa (IFAN), within the University Sheikh Anta Diop. 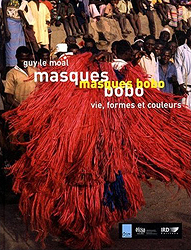 It is part of official sites receiving writings displayed during Biennial of Dakar. Located on the place Soweto, the building was constructed in 1931 in fashionable Sudanese style then and first sheltered the seat of the Administration Dress rehearsal de l' AOF, then the museum after creation in 1936 by French Theodore Monod de l' Institut of Black Africa (IFAN), which will change name without changing acronym in 1960s. It is only at this instant when collections are really put in the disposition of the public. However the first recording of object dates of 1941. The museum was renovated in 1995. From January, 2005 till February, 2008, the conservative was Abdoulaye Camara. For a long time called Africain Art museum, he changes name in 2007, by the presidential decree n ° 2007-1528 of December 13th, 2007 and takes that of Museum Africain Theodore Monod d' Art.